As Joy the Baker would say, it’s time for some real life real talk. I’m about to get honest. The past couple months have been a struggle for me to keep this whole blog thing alive. What started out as a lot of fun has lately felt more like work. Once upon a time I’d bake 3 times a week and still have a list brimming with things to try. Now I’m lucky if I can come up with 1 thing a week. Words used to flow from my brain—more than I could fit in a post. Now I stare at a blank screen, trying desperately to fill it with a few measly paragraphs. Somewhere along the way I’ve lost my mojo, and sometimes I wonder if it’s even worth trying to find it again. Sometimes I think it might just be easier to quit. But then I think about everything that I’ve done here. All the things I’ve tried that I never would have if I didn’t push myself to keep coming up with something new. Bacon Cupcakes. Macarons. A Mario Cake. And all the people I’ve met, and all those that stay hidden in the background that I haven’t met yet. All those who have sent me messages saying they’ve baked something of mine. And I know I’d miss it. This is a part of me. I’ve put my heart and soul into this little slice of blog life, and I’d be lost without it. So it’s time I picked myself up off the couch and wandered back into the kitchen. It’s time to take myself back to the humble beginnings of this journey. To where I first started 3 years ago. It’s time to make some cupcakes. These cupcakes are exactly what I needed to get myself back on the right track. Everything about them is perfect. For the first time EVER, I pulled perfectly domed vanilla cupcakes out of the oven. Every batch of vanilla I’ve ever made has been too short, overflowed, or sunk in the center. But these were perfection. And they tasted heavenly! Deliciously vanilla. And the frosting! The frosting! I FINALLY got the rose piping! I’ve tried and tried and tried, and it never looked right. But I was so happy with how they looked this time! And the taste.. Oh man. Seriously. If you haven’t tried Swiss Meringue Buttercream, you’re missing out. It’s light and fluffy and silky smooth. None of that buttercream that tastes like a sugary stick of butter. So I just want to say thank you to everyone who has stopped by here in the past 3 years. To everyone who has written a comment or a little note to me. You guys are why I’m still here. I think about you more than you’ll probably ever know. You’re the ones I want to share my sweets with, and I hope you’ll keep coming back for more. Because there will be more. Definitely more. 1. Preheat oven to 350F. Line a standard muffin tin with paper liners; set aside. 3. In the bowl of an electric mixer, cream butter and sugar until light and fluffy, about 3 minutes. 4. While butter is creaming, in a measuring cup or medium bowl, combine milk, egg whites, and vanilla bean seeds, and whisk well to combine. 5. Add flour mixture and milk mixture in alternating additions, beginning and ending with the flour mixture, scraping down the sides of the bowl after each addition. Once all the ingredients have been added, mix on medium speed for 1 minute. 6. Divide batter into prepared liners, filling about 2/3 full. Bake until a cake tester inserted into the center of the cake comes out clean, about 15 to 18 minutes. Remove from oven and cool in pan for about 5 minutes before transferring cupcakes to a wire rack to cool completely. 8. Pour the mixture into the bowl of an electric mixer fitted with the whisk attachment and beat on high until the bottom of the bowl is cool to the touch and the whites have formed stiff peaks. 9. Add the butter, a tablespoon at a time, beating until each is well combined before adding the next (about 15 seconds in between). If the mixture looks soupy after adding the butter, put it in the refrigerator to chill for about 5 to 10 minutes before continuing to beat. 10. Once the butter has been added, switch to the paddle attachment, and beat on high until light and fluffy, about 5 minutes. (The mixture will probably break and look curdled at one point—don’t worry it’s totally normal. Just keep beating away. It’ll come back together.) Once the buttercream is fluffy, add almond extract and food coloring, if using, and beat until well combined and fluffy. Pipe immediately onto cooled cupcakes. so pretty! thanx for posting again :-) hugs! For what it's worth...your blog was one of the reasons my sister and I started our blog. We love your ideas and beautiful photos and delicious recipes! Thank you for inspiring us :) P.S. 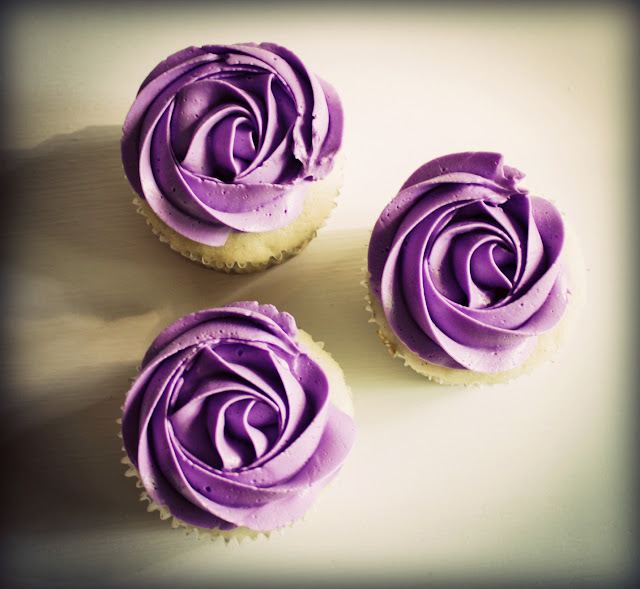 - These cupcakes look amazing! Gorgeous cupcakes. I'm glad that you are still here. I'd miss you too much! I just found and subscibed to your blog a few months ago. I really look forward to your recipes and have tried a few. These cupcakes are beautiful and I can't wait to try them and that kind of frosting will be a first for me. Keep up the good work, but don't feel pressured. 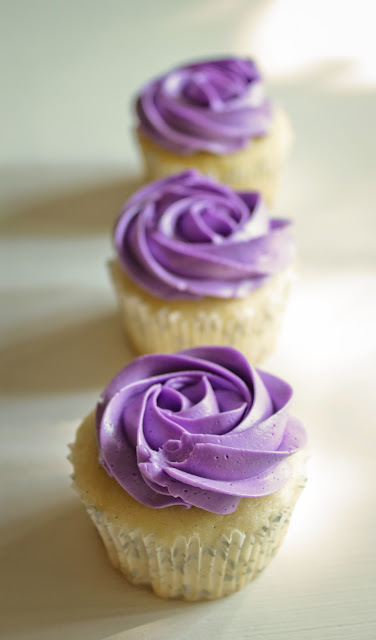 These cupcakes look lovely, I love the rosettes. Glad to hear you've got your mojo back, your blog was on of those that inspired me to begin blogging. Looking forward to seeing whats next. I made these cupcakes today. I didn't have milk so I used buttermilk. And I added a splash of almond extract. They are delicious. I didn't even put frosting on them. Thanks for sharing!!! could you tell me which piping tip you used for this? What brand and type of food coloring did you use? That purple is gorgeous! Anonymous - I use a 1M star tip for almost all my cupcakes. 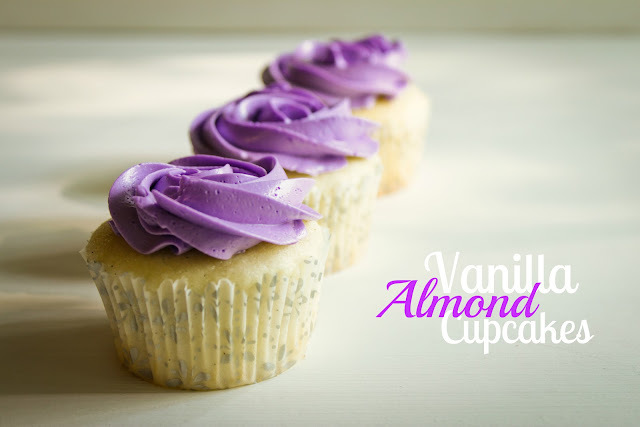 This cupcake recipe is amazing! Thanks for sharing!